Virtual Tableau Training Tip: Pasted Data Source - Did you know you could do that? Old School - But, REALLY COOL! Virtual Tableau Training courses cover an ever increasing variety of topics that range from beginner to advanced. Here are two more examples. Have a look! These previews are a just small sample of what's available. 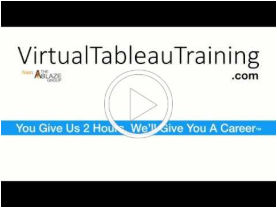 Enrich your skills and cement job security with Virtual Tableau Training. You Give Us 2 Hours, We'll Give You a Career!